A 1951 Ferrari 340 America Barchetta sold for $8,200,000 as the top result at the 2016 RM Sotheby’s Monaco classic car auction. Seven cars sold for more than a million dollar but the much hyped 1968 Ferrari 275 GTS/4 NART Spider failed to sell despite a highest bid of €17 million. RM Sotheby’s held it 2016 Monaco classic car sale during the Grand Prix Historique week on May 14, 2016, at the Le Sporting Monte Carlo. The RM Sotheby’s Monaco 2016 sale exceeded €27.5 million (USD 31,187,305) despite the top billing 1968 Ferrari 275 GTS/4 NART Spider and several further classic Ferraris failing to sell. *Prices include buyer’s premium. Sale in euro – conversion to USD at €1 = $1.1348. The highest bid at the auction was €17 million for the 1968 Ferrari 275 GTS/4 NART Spider. 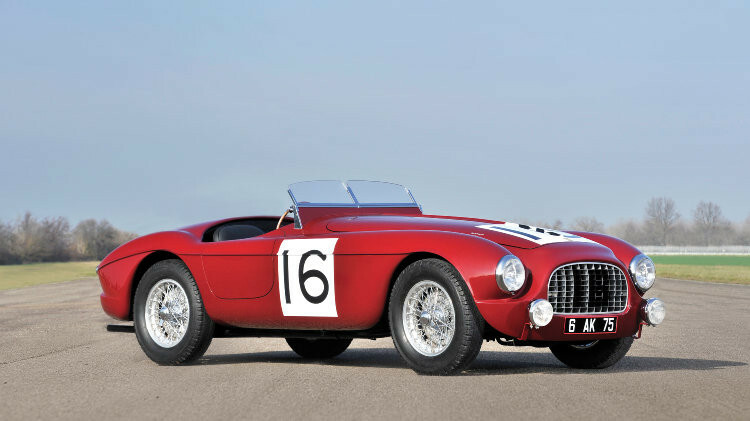 The top result at the 2016 RM Sotheby’s Monaco classic car auction was €7,280,000 for a 1951 Ferrari 340 America Barchetta by Touring. This was also the highest result in Monaco during the weekend – the 1953 Jaguar XK120C at Bonhams sold for €35,000 less. This 1951 Ferrari 340 America Barchetta by Touring was originally owned by Pierre Dreyfus, who had Louis Chiron and Luigi Chinetti racing it at Le Mans. The Ferrari was disqualified after it had been refueled on the racetrack and during the 1952 race retired with mechanical issues. More recently, it participated in historic rallies including five times at Mille Miglia Storico. A 1997 Porsche 911 GT1 Evolution sold for €2,772,000 as the second highest result at the RM Sotheby’s 2016 Monaco sale. This Porsche is a three-times Canadian GT Championship winner and won 13 of the 31 races entered. Porsche built only 41 of the 911 GT cars, of which this is the only one of the 18 racings cars registered for road use. A 1966 Ferrari 275 GTS sold for €1,792,000 – a tenth of the unsuccessful highest bid for the 1968 1966 Ferrari 275 GTS/4 NART Spider. This car has covered only 24,000 miles since new and is very original with original interior and paintwork. Only 200 of the Ferrari 275 GTS cars were built. A similar model, but in less original condition, failed to sell at Bonhams a day earlier with a highest bid of €1,440,000. A 1948 Tucker 48 sold for €1,344,000 at the RM Sotheby’s Monaco sale. This car was the last complete Tucker 48 built by the factory and is the only Tucker 48 in Europe. The fully restored Tucker 48 wears its original color scheme of Waltz Blue. Only 51 of these cars were ever built. Mercedes Benz 300 SL prices have been weaker at recent auctions and the numbers on offer have similarly been in decline. However, the €1,232,000 ($1.4 million) paid for this 1955 Mercedes Benz 300 SL Gullwing Coupe is the highest result for a Gullwing thus far in 2016. The 1955 Mercedes Benz 300 SL Gullwing Coupe was part of the Count Augusta Collection and sold out of single-family ownership. It is in a largely original and very well-maintained condition. With four of the top six Ferraris failing to sell, the 1952 Ferrari 212 Inter Cabriolet became the third most-expensive Ferrari at the 2016 RM Sotheby’s Monaco sale. The 1988 Porsche 959 Komfort “Stage II” sold for just over a million dollars at the 2016 RM Sotheby’s Monaco sale. It is one of only three cars produced in black but the Stage II upgrade was only done more recently. This 1988 Porsche 959 Komfort had covered only 10,000 km since new. In contrast, a 1988 Porsche 959 Komfort with 158,047 km on the clock sold for almost half the price at €494,500 at Bonhams a day earlier. Several top cars failed to sell at the RM Sotheby’s Monaco 2016 classic car auction including the 1968 Ferrari 275 GTS/4 NART Spider. The highest bid this car received was €17 million (€2 million below lower estimate). If this bid were accepted, this would have been only the seventh car ever to have sold for over $20 million at public auction. At recent auctions, several 1960s and early 1970s Ferraris in the $1 million to $3 million range have failed to sell. None of the top Alfa Romeos was sold in Monaco (neither at RM Sotheby’s nor at Bonhams). Similarly, the two racing Peugeots – a Le Mans car and a Rally Group B car – failed to find buyers. In contrast, the Benetton Ford F1 that gave Michael Schumacher his first podium finished sold for over a million euro (four times pre-auction estimate) at Bonhams a day early.